Acro stamps these parts for the iconic barber’s jar of combs on a 110-ton servo press. It was able to reshore the job from China thanks to the ability of the servo press to draw and form the prepolished stainless steel without affecting its surface finish. Under previous production methods on a conventional press, the stamped parts required a secondary hand-finishing process. The last five years for Milwaukee, WI metalformer Acro Metal Stamping have been a renaissance period. The company has “reinvented” itself to emerge from the industry downturn and recover from a Chinese invasion of its customer base. So says Acro president Jim Wolfenberg, who admits that from 2005 to 2008, Acro lost 20 to 25 percent of its book of business to China. Add recessionary pressure during that time and “we needed to reinvent the company,” Wolfenberg admits. Before its renaissance, Acro’s custom-stamping business centered on a fleet of 20 to 25 conventional mechanical presses from 32 to 150 tons, with bed size to 27 by 53 in. In 2010 its pressroom makeover kicked off with the acquisition of a pair of Komatsu servo presses —a 110-ton and a 200-ton model. Two more servo presses landed in 2011, 60- and 80-ton models. Finally, early in 2013 Acro added another 200-ton Komatsu servo press and a 60-ton servo press. Asked to elaborate, Wolfenberg credits the flexibility and stroke control that comes with servo-press technology with Acro’s ability to add deep drawing of stainless steel to its resume. Case in point: stamping parts for the iconic comb container found in nearly every barber shop and hair solon. To form the top cover of the container, Acro’s 110-ton servo press performs a nearly 2-in. draw on a 4-in.-dia. blank of 0.012-in. stainless steel. 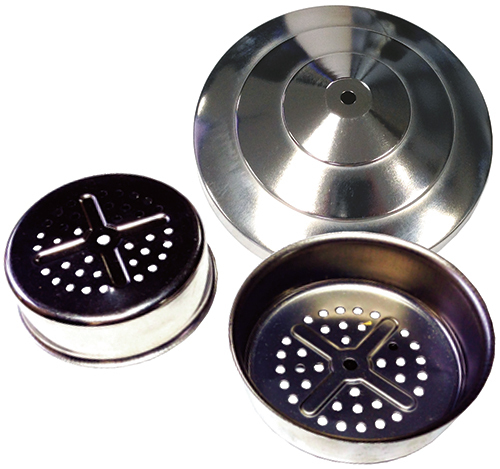 The press also forms the stainless-steel strainer that sits inside the comb container. Both jobs had previously been offshored to China, and Wolfenberg is understandably quite proud to have reshored the work. Acro was able to reshore the job thanks to the ability of the servo press to draw and form the prepolished stainless steel without affecting its surface finish. Under previous production methods on a conventional press, the stamped parts required a costly and time-consuming secondary hand-finishing process. Other additions to Acro’s resume, thanks to servo-press capabilities, include increased ability to perform in-die tapping, cam-actuated operations and coining. “When tapping, with the servo press, we can actuate the tapping operation at any point in the stroke, and control ram speed,” Wolfenberg says. “With a conventional press we only can tap during one portion of the stroke. We have much more flexibility in our process now. The ability to perform more work per press stroke also has allowed Acro to simplify its tooling and eliminate stations from the complex progressive dies it designs and builds. “We’re typically taking four- to five-station dies down to two or three stations,” says Acro toolroom supervisor Jim Wobig. Wobig quickly credits the firm’s move in 2010 to 3D die design (Logopress3) with helping the company leverage the flexibility of its servo presses.